← MIDDLE EAST REVOLUTION: BUSH DOCTRINE VALIDATED? US News: President Obama, despite all his recent bravado about being bipartisan and cutting the deficit is the biggest tax and spend president in history. 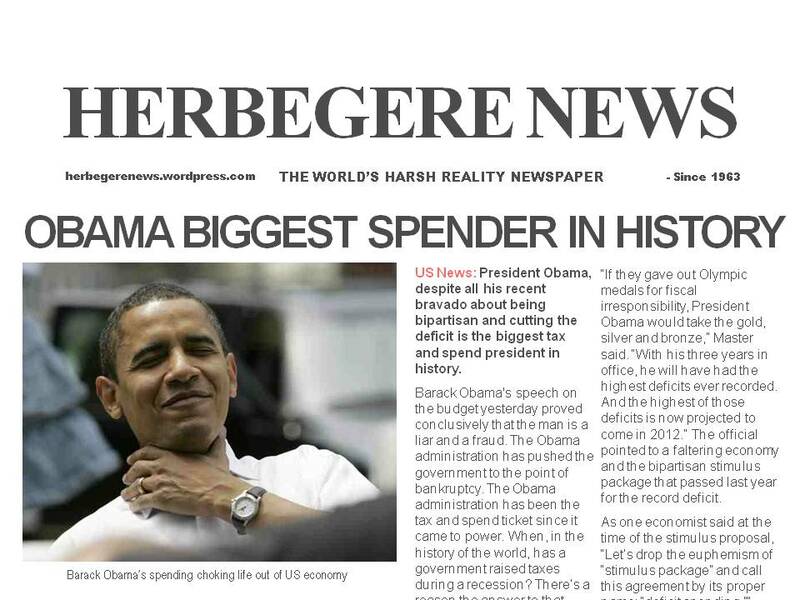 Barack Obama’s speech on the budget yesterday proved conclusively that the man is a liar and a fraud. The Obama administration has pushed the government to the point of bankruptcy. The Obama administration has been the tax and spend ticket since it came to power. When, in the history of the world, has a government raised taxes during a recession? There’s a reason the answer to that question is: never. “If they gave out Olympic medals for fiscal irresponsibility, President Obama would take the gold, silver and bronze,” Master said. “With his three years in office, he will have had the highest deficits ever recorded. And the highest of those deficits is now projected to come in 2012.” The official pointed to a faltering economy and the bipartisan stimulus package that passed last year for the record deficit.